MARYKNOLL, N.Y., Sept. 12, 2018 /Christian Newswire/ -- The people among us who serve exploited populations in foreign lands rarely receive recognition for their decades of dedication and sacrifice. Their names often remain unknown along with their achievements. Their tales about serving the poor, sick and marginalized rarely generate media headlines. Now, for the first time, the new podcast "Among The People" is providing overseas missioners with the opportunity to share their inspiring and impactful mission stories. 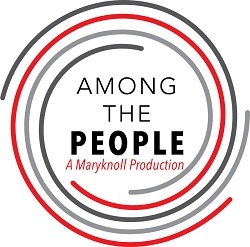 "Among The People" is produced by the 107-year-old Catholic Foreign Mission Society of America that is popularly known as the Maryknoll Fathers and Brothers. Maryknoll missioners follow Jesus in serving people in need in more than 20 countries. They share God's love and the Gospel in addressing poverty, providing healthcare, building communities and promoting human rights. This new series of interviews has been introduced during the centennial year of Maryknoll's first mission sending, a tradition of "Called~Sent~Transformed"—Called by name in community through baptism, Sent by the Catholic Church in the U.S. in missionary discipleship and Transformed by love through relationships and thankfulness. After receiving Vatican approval to begin missionary work in China, four Maryknoll priests—Father Thomas F. Price (Maryknoll co-founder), Father James E. Walsh, Father Francis X. Ford and Father Bernard F. Meyer—departed for China on September 7, 1918. "Among The People" delivers personal stories that provide the transformational experiences of life found in, or connected to, overseas mission. The Maryknoll podcast is hosted by Maryknoll missioner Father Joseph Veneroso, reporter Megan Fleming and producer Adam Mitchell. The interviews are available on the Maryknoll website (MaryknollSociety.org/podcast), iTunes, Google Play, Soundcloud and Spreaker. The October 14 canonization of Archbishop Oscar Romero, the Archbishop of San Salvador martyred during 1980 as he celebrated Mass, inspired two specific "Among The People" interviews. The first podcast, released on August 31, features Franciscan Brother Octavio Duran discussing the ways his life and work have been inspired by Archbishop Romero. A corresponding article appears in the September/October issue of "Maryknoll" magazine (MaryknollSociety.org/publications). The second interview, with Maryknoll's Father John Spain, will recall the priest's experiences of working closely with Archbishop Romero in San Salvador. It will debut on October 5. Other missioners featured in the series include Maryknoll priests and brothers who discuss their lifetime work in Asia, Africa and Latin America. Their stories include a description about serving in mission with Mother Teresa and the tale of a priest who sees the face of Jesus in an elderly woman. Another missioner conveys his frightening experience of becoming a prisoner of gangs roaming the jungles of Guatemala while a 91-year-old priest takes listeners on a journey to Chile at a time when he traversed the dirt roads and mountain trails to share the Gospel with poor farmers. Besides Catholic clergy, "Among The People" also features the faithful from the pews who share interesting stories that are weaved into the church and mission experience. A leader in pastoral music offers a brief history about sacred music and discusses the shifts within the church, including the trend toward a more traditional celebration of worship. A woman lay missioner who has served incarcerated women in the United States, Brazil and Kenya documents her experiences to conclude that women generally are overlooked in prison policy and advocacy. "Among The People" features the men and women from across the U.S. whose lives have witnessed or touched mission. From New Jersey, Pennsylvania, North Carolina, California and other states, their stories finally are heard by their neighbors and others of all faiths and beliefs back home.